Recipients of the October 2016 Sarah Morrison Student Research Awards are (top left to bottom right) Muhammed Alikhan, Hunter Faris, Luke He, Jacob Lee, Imran Nizamuddin, Carlee Oakley, Sai Vanam, and Ara Staab. The School of Medicine’s Student Research Program has announced winners of the October 2016 Sarah Morrison Student Research Awards. Eight students received awards to support their research efforts and help fund their presentations at conferences and scientific meetings. Seven of the recipients are B.A./M.D. 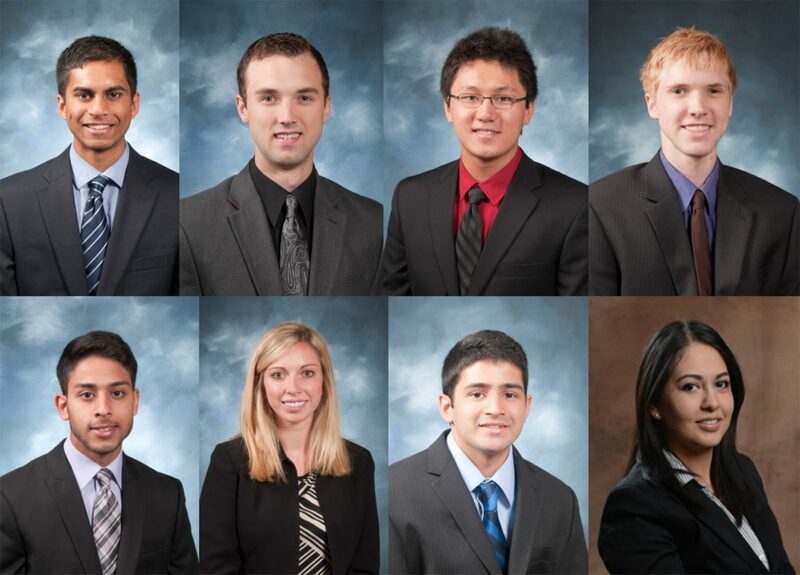 students: Muhammed Alikhanm, Hunter Faris, Luke He, Jacob Lee, Imran Nizamuddin, Carlee Oakley and Sai Vanam. One recipient, Ara Staab, is a School of Medicine graduate student. Sarah Morrison award recipients are reviewed by a committee of faculty judges and processed through the school’s Office of Research Administration. Awards of up to $1,500 are presented each April and October. Since 2013, 45 student research projects have received more than $61,000 of financial support from the Sarah Morrison award program. Each School of Medicine winner at the 2016 UMKC Health Sciences Student Research Summit had received Sarah Morrison award recognition. Two received top awards for research posters at the annual Missouri chapter of the American College of Physicians annual meeting, and others have been invited to present their research at national and international scientific meetings.